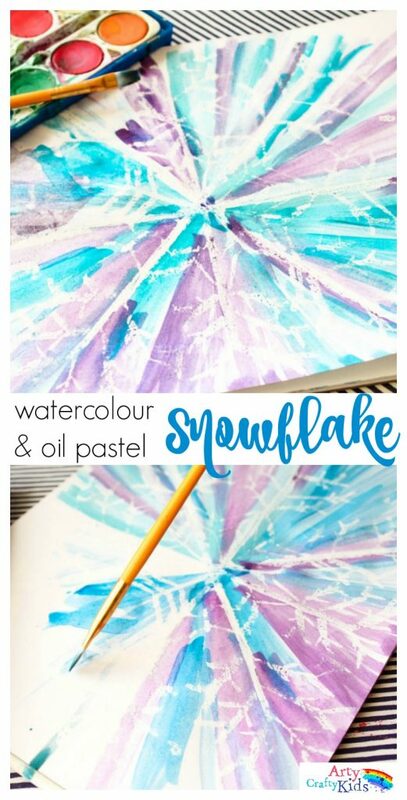 I adore this watercolour and oil pastel resist snowflake. Oil pastels have become one of my favourite materials for resist art. For one, it takes a mere few minutes to set up. So if you have young children with short attention spans, then this process is perfect for them! So far we’ve used this technique for a spider web and spooky ghost reveal. Both concepts have proven popular. 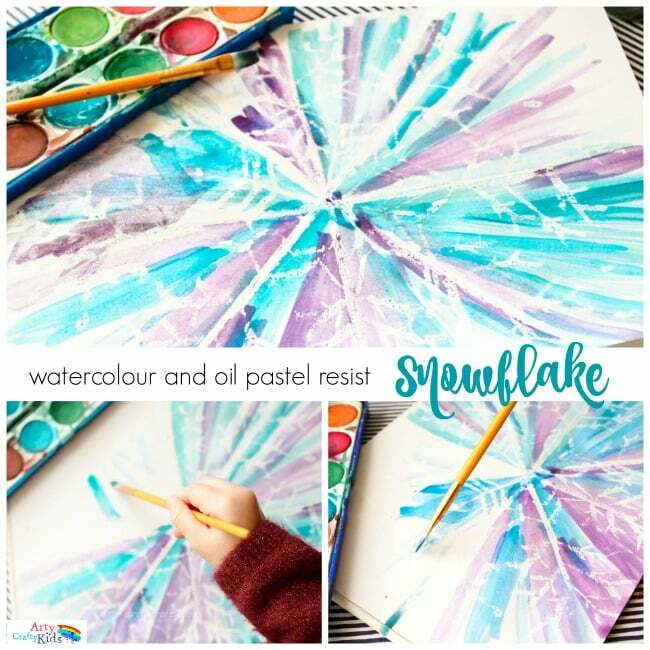 Kids love the secret reveal and with respect to our snowflakes, the watercolours against the white pastel works tremendously well, creating a gorgeous winter scene. 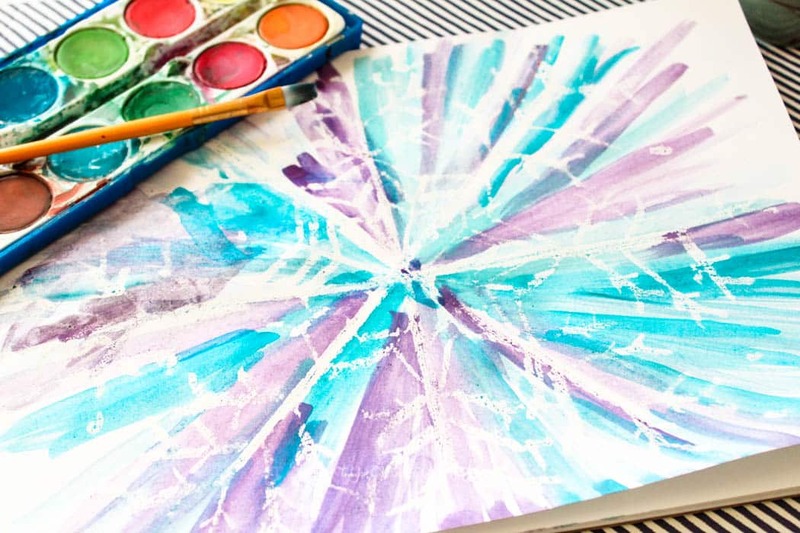 Using a white oil pastel, draw a snowflake design onto the watercolour paper. 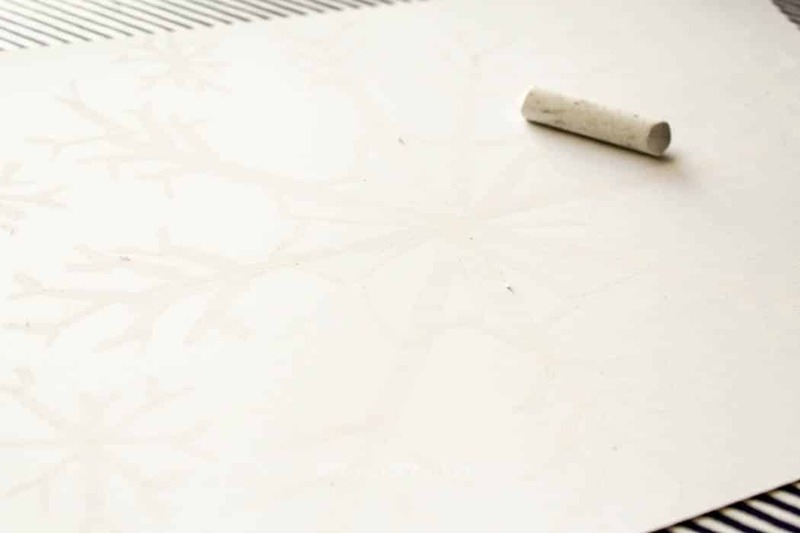 To draw the snowflake, start with four criss-crossing lines of equal lengths (it should resemble a star shape). From a couple of cm from the centre of the snowflake, join the branches with a zig-zag and draw another connecting line from the lowest point of the zig-zag to the centre. At the end of each of the long lines, draw 3 (or more/less) V shapes. The snowflake should begin to take form now and if you have an older child, this is a great way to get them thinking about symmetry. 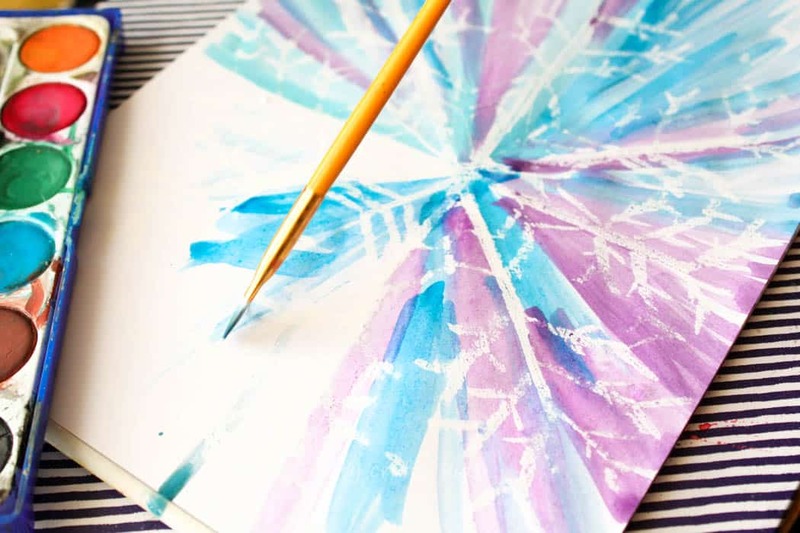 Next, begin covering the snowflake with watercolour paints. 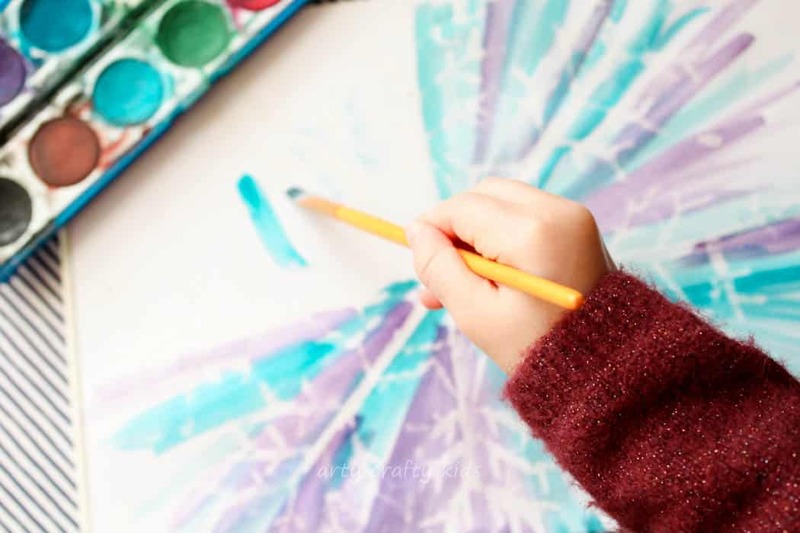 If your child is new to watercolours, simply encourage them to apply their brush with water before selecting their colour. Once the brush is wet, add colour and apply. This method will create sharper colours and lines. 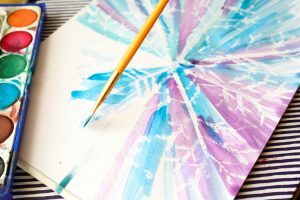 For softer shades and to make the spread of the paints a little easier, dampen the paper with a sponge before applying the watercolours and then continue as before. Use the centre of the snowflake as the starting point for each application of paint and follow the line away form the centre. My 6 y/o alternated between the blue and purple, adding more or less water to create varying shades. My preschooler on the otherhand, applied the paint all over the place, not caring for any lines or colour pattern and the enjoyed the process just as much! 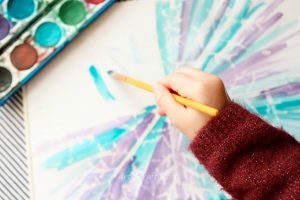 Watercolours and oil pastels are not typical candidates for the kids craft cupboard, however in the spirit creative exploration, I think it’s hugely important for kids to have the opportunity to explore different mehods and techniques. And these additional supplies are not expensive and practically last forever! If you are new to these materials, then an art project like this watercolour and oil pasel resist snowflake is a good place to start! 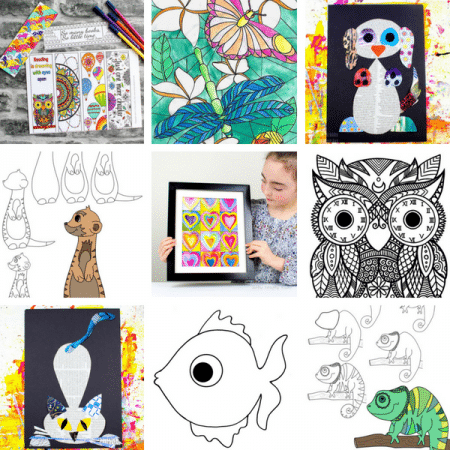 Click Here for more Arty Inspiration! 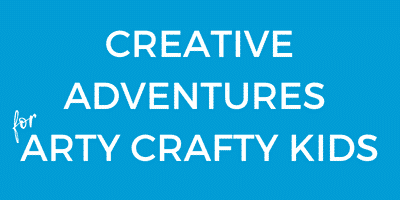 Sign-Up to the Arty Crafty Kids newsletter for regular up dates!